After the European Commission declared it would not pursue provisional antisubsidy duties against Argentine and Indonesian biodiesel, the European Biodiesel Board expressed strong concern that imports will continue to hamper EU biodiesel producers. A total of 56,460 D3 cellulosic biofuel RINs were generated in July, representing 37,639 gallons of fuel. The biofuels industry also produced 26,031 gallons of cellulosic diesel and generated 44,253 D7 cellulosic diesel RINs in July. 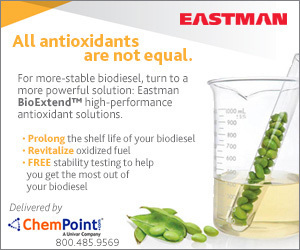 The U.S. EPA reported 132 million gallons of biodiesel production for the month of July and year-to-date volume of more than 768 million gallons. More than 166 million gallons of biomass-based diesel were produced in July, including renewable diesel. Neste Oil Corp. and Raisioagro have launched a research project to investigate the potential of straw as a raw material for producing renewable diesel. The project will study the harvesting chain and storability of straw for use year-round. The Hawaiian Electric Companies began a search for suppliers of cleaner fuels, including ultra-low sulfur diesel, biodiesel or biodiesel blends. The companies are seeking up to 150,000 barrels per year (6.3 MMgy) by Jan. 1, 2015, for three years. 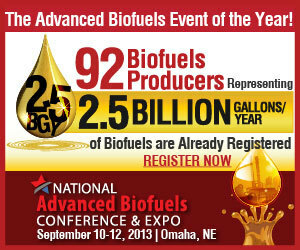 SeQuential-Pacific Biodiesel hit a company milestone producing its 20 millionth gallon this week. It also announced an agreement with University of Oregon to recycle cooking oil from the concessions stands operated by the athletics department. Together, R.C. Costello & Associates Inc. and Zeton Inc. will provide a customized "end-to-end" solution from feasibility studies, process simulation, front end engineering through detailed design, procurement, fabrication and factory testing.